For those of you who are fans of the splendid orchid flowers, perhaps these unique colorful arrangements pictured below on this page can make a beautiful source of inspiration. We recommend orchid wedding flower arrangements and bouquets for both classy and modern brides who are planning an elegant and stylish event. Compared to other types of flowers like roses, tulips or carnations, orchids are much more modern in appearance and eye-catchy. It doesn’t really matter in what colors you choose them, as long as you are paying attention to the exact type of bouquet shape and design you’re planning. 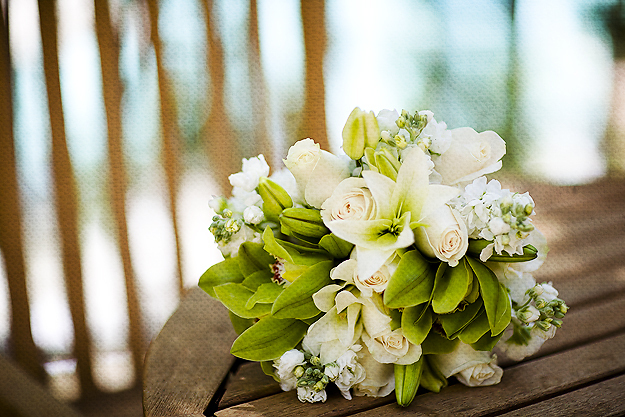 Orchids look gorgeous in both natural touch bouquets and classic elegant bouquets. Therefore, you have to choose the one that can suit best the formality, the theme and the location of the wedding you’re planning. We thought to present you here one of our favorite types of themes or colors schemes: the white and green theme. 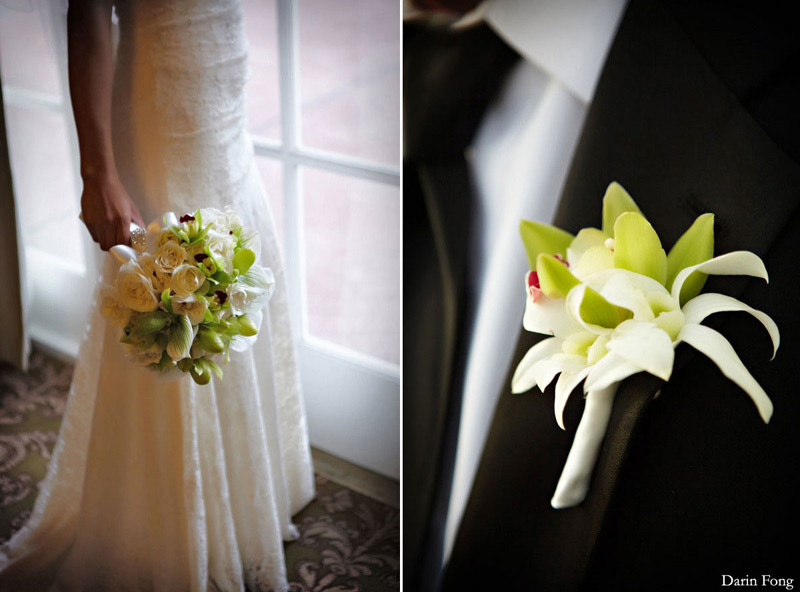 Orchids are a top flower choice for many brides when it comes to this wonderful color palette. 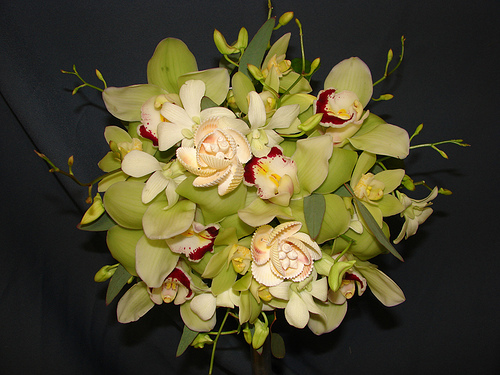 The green cymbidium orchids are simply sensational and miraculous! We also love the white ones, which can offer any bride the most refined, dainty and exquisite type of wedding or look ever! 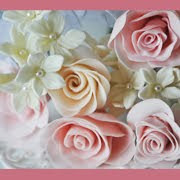 These romantic sculpted like blooms are available all year round and this is perhaps one of the many reasons why a bride can actually choose them over other types of flowers. However, we must mention here that in comparison with other blooms, orchids are much more expensive because they are exotic and imported from tropical regions. Anyway, this can only be a problem for brides who must deal with a very limited type of budget which doesn’t allow them to spend too much money of the flower arrangements. Nevertheless, no one should use too many stems of orchids anyway! In fact, we should mention here that an orchid wedding bouquet looks always more impressive, eye-catchy and elegant with fewer blooms. A green and white orchid wedding flower bouquet can make a gorgeous selection for brides who are planning a formidable wedding in the middle of the nature. 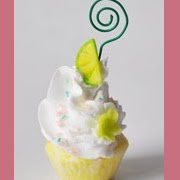 Whether used for spring or a summer season weddings, these types of flowers make wonderful vibrant selections. We invite you to view more of these precious types of flower arrangements and bouquets on our website, and see whether you can find other theme or color scheme more attractive or suitable than this one. Green and white orchid wedding flower bouquets can add more naturalness, vibrancy, sensuality, innocence, cheerfulness, elegance, refinement and gorgeousness to the bride’s face, making her look more unique, radiant and fashionable. Green themed weddings are very popular and chic these days, where the white and green palettes are only chosen by brides who are afraid of going too colorful, vivacious or trendy! The secret is to use the orchid blooms in a loose, casual and simple arrangement in order to obtain a natural touch bouquet that can look modern, inspiring, eye-catchy and appropriate for a wedding.